Battery boxes come in many shapes and sizes, and the purpose of using one can even change from one industry to another. For example, those who engage in yachting activities need to secure spare batteries within a box for compliance purposes. When it comes to simple DIY in the home, or owning a workshop on a business premises, you’ll still want to consider a battery box for storage of power cells, though not for the same reasons. Read ahead to find out more. The main justification for getting a battery box is when you have no space for any more equipment within your tool box, so the last thing you want to do is store a battery inside the chest if you have no purpose for it. Not everybody who owns a tool chest will require a battery box. Battery boxes aren’t simply a mechanism for containing your batteries in a separate and more convenient place to your tools; they offer protection, both to the batteries stored inside and to you and your workshop environment. They prevent your tools from damaging the battery and vice versa. If you’re someone who operates power tools, then you can likely get away with a very small battery box, as the batteries that power such tools are typically quite small. The benefit here is that you can use your existing batteries to measure up against potential candidates before you make a purchase, ensuring that no space is wasted in your chest. Stepping up from simple power tools, you may be a mechanic working within a workshop. In such scenarios, you may be looking to store even larger automotive batteries. Though not all will fit into a tool chest, you’re going to need a larger unit for such a battery. 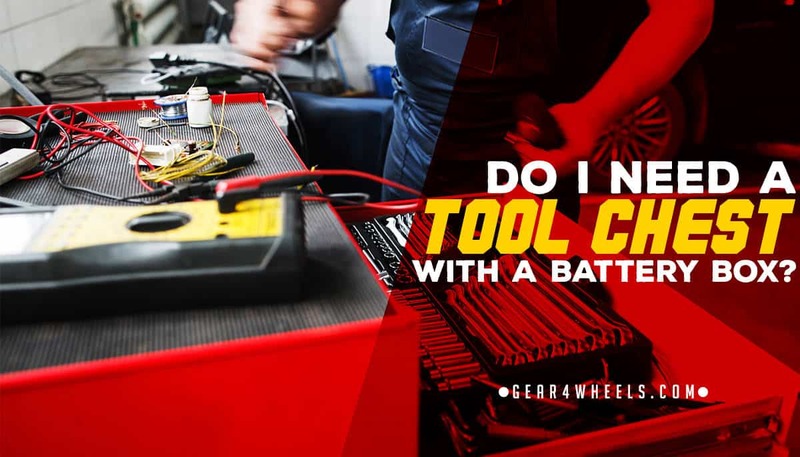 The bottom line is that if you don’t meet any of the above categories, then you likely don’t need to worry about getting a battery box when buying a tool chest. Worst case scenarioi, you can always buy and add one in at a later date once you know exactly what your requirements are. Storing a battery within a designated battery box prevents acid from spilling out if the power cell is compromised, protecting both your other surfaces as well as anybody working in the workshop; battery acid is highly corrosive. Some batteries can also give off gas while being operated or while charging. Though this doesn’t apply to most units, there’s still a risk to health if a battery does give off any fumes that are subsequently inhaled. Finally, these boxes can also offer an enormous guard against property damage in case a battery catches fire. Not all batteries require storage within a box. The main types that should be stored in this way are lead acid batteries, as lead is highly toxic and can be absorbed not only by your own body, but by the environment, too. As mentioned above, you should carefully consider whether you actually need battery storage space separate to your tools, and if you don’t, it’ll just be a waste of potential tool storage space.